The Congressional Medal of Honor Society announces that Master Chief Hospital Corpsman William R. Charette, Medal of Honor recipient, passed away Sunday, March 18, 2012 in Lake Wales, Florida at age 79. 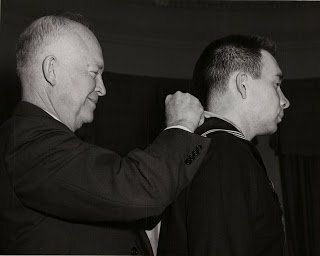 He was awarded the Medal of Honor by President Dwight D. Eisenhower at a White House ceremony on January 12, 1954. His heroic action occurred at the Panmunjam Corridor (DNZ) Korea, on March 27, 1953. As a Hospital Corpsman Third Class he served with the 1st Marine Division attached to Company F, 2nd Battalion, 7th Marines. Observing a seriously wounded comrade whose armored vest had been torn from his body by the blast from an exploding shell, he selflessly removed his own battle vest and placed it upon the helpless man although fully aware of the added jeopardy to himself. Moving to the side of another casualty who was suffering excruciating pain from a serious leg wound, HC3c. Charette stood upright in the trench line and exposed himself to a deadly hail of enemy fire in order to lend more effective aid to the victim and to alleviate his anguish while being removed to a position of safety. By his indomitable courage and inspiring efforts on behalf of his wounded comrades, HC3c. Charette was directly responsible for saving many lives. His great personal valor reflects the highest credit upon himself and enhances the finest traditions of the U.S. Naval Service. Funeral services are pending. There are 81 recipients alive today.